Even when the theft deterrent system is in the disarmed state, the security indicator blinks due to a signal output from the immobiliser system. The security indicator blinks continuously due to a continuous signal received from the immobiliser system while in the armed state. 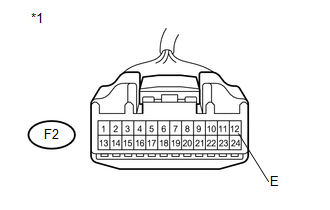 The main body ECU (driver side junction block assembly) causes the security indicator to come on only during the arming preparation and alarm sounding states. 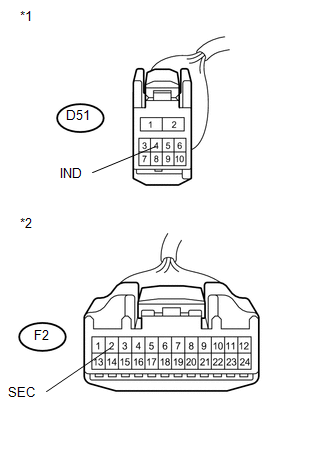 (d) Select the item below in the Active Test and then check that the indicator operates. The security indicator light flashes and goes off correctly when operated through the Techstream. 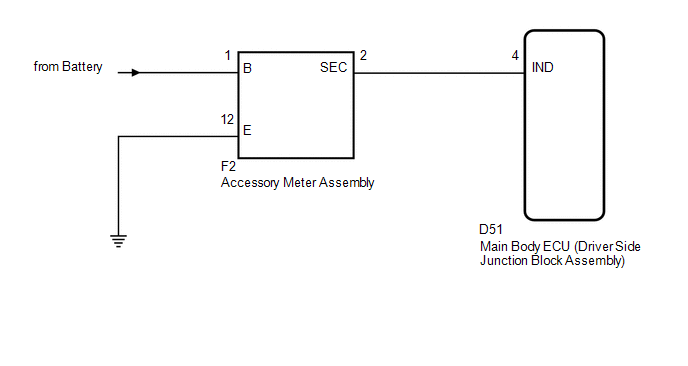 (b) Disconnect the F2 accessory meter assembly connector. (a) Reconnect the F2 accessory meter assembly connector with the D51 ECU connector still disconnected. 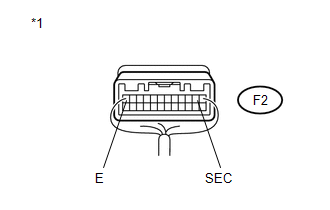 (b) Apply battery voltage from the wire harness back side between the specified terminals of the indicator, and check the lighting condition of the security indicator. If the positive (+) lead and the negative (-) lead are incorrectly connected, the security indicator will not come on. Voltage of more than 12 V will damage the security indicator. If the voltage is too low, the security indicator will not come on.